GOSHEN, N.Y. (March 26, 2018) – On Thursday, March 22, Glen Arden hosted an informational session geared toward people preparing to sell their homes. The event included presentations and tips by real estate and moving professionals, as well as a selection of related vendors offering additional information and offer of services to those interested. A large audience filled Glen Arden’s Rhinebeck Room for the event. Donna Gennaro, an associate broker with Rand Realty was one of the day’s main presenters. She provided attendees with valuable insights into current real estate market trends. Thomas Santoro, from House Detector Home Inspector, gave a presentation on preparing a property for inspection. Getting organized for a move can make a home seller feel as though they don’t know where to begin. Colleen Ashe, of Ashe Organizing Solutions, shared her tips for making sure everything is in order for a smooth move. Presenters also focused on downsizing, including making donations as part of the process. Additional presenters and vendors who took part were Certified Interior Designer Betsy Ross, Michael Bauer, of Scan Advantage, who discussed document imaging and management, and Cathy Eschbacher, from Triangle Movers. Glen Arden, the Hudson Valley’s premier Continuing Care Retirement Community, offers seniors 62 and older the perfect combination – independence with the assurance of quality health care, if it’s ever needed. 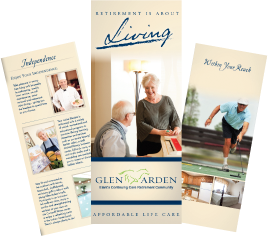 Located in beautiful and historic Goshen, N.Y., Glen Arden offers housing choices for an active lifestyle and support services to help residents live comfortably and independently.